Once upon a time, I truly loved ET the Extraterrerstrial. When it came out in 1982, I was 15 and fell for it instantly. I saw the movie six times that summer and I quickly came to regard it as my all-time favorite. I eagerly bought the videotape when it finally hit shelves in 1988, and I also owned two laserdisc releases in the Nineties, with the most recent being an elaborate “Signature Collection” edition from 1996. Over that time, I must admit my passion waned, and I came to view some other films higher on my “all-time faves” list. Still, I maintain a deep love for the movie and think it continues to delight and move. ET tells the simple story of a boy and an alien. Pre-pubescent Elliott (Henry Thomas) discovers the critter in his backyard one night and decides to “adopt” him. He names the visitor “ET” and the two quickly become best friends. Except for Elliott’s teen brother Michael (Robert MacNaughton) and little sister Gertie (Drew Barrymore), no one knows of ET’s existence – or so they think. Elliott and ET bond but they soon realize that if he doesn’t return to his home planet he’ll die, so they attempt to contact his companions. In the meantime, government agents – represented mainly by a mystery man notable because of his ever-present jangling keys (Peter Coyote) – stalk ET so they can take possession of the alien. That latter element leads to some climactic action, but overall, ET offers a tremendously simple story. The magic of the film comes from what Spielberg does with it. It seems amazing to consider just how much of an emotional impact the film packs with a squishy brown puppet as a lead character. It’s one thing for audiences to care for personalities in animated films, but when you place a non-human in a live-action setting, it becomes much more difficult. To be sure, folks embraced entities such as Yoda or R2-D2, but neither of these asked so much emotionally. We love and care about those characters, but we never confronted any deep feelings as part of those films. Even when Yoda died in Return of the Jedi, it occurred in a quick and fairly non-emotional manner. On the other hand, Spielberg asks us to accept ET as another member of the cast, and he tries to get us to feel for the character just as we would for any of the humans in the film. Miraculously, Spielberg pulls off this feat, as many tears are shed during a screening of ET, but not because of direct harm to the humans. We become deeply sad due to the events that affect ET himself. Intellectually, we know this is nothing more than a puppet on steroids, but that doesn’t keep us from emotional involvement in the role. No one made us love a piece of hardware this much before Spielberg got his hands on ET, and no one’s done it since then either. It helps that Spielberg amassed a cast who helped us believe. Spielberg developed a legendary touch for working with kids largely based on his handling of this crew. Granted, he did very nicely with little Cary Guffey in 1977’s Close Encounters of the Third Kind, but that role required much less involvement than did the trio of ET. Guffey’s Barry was an important role, but he remained fairly tangential most of the time. Instead, ET focuses on a world dominated by children. Adults play their roles, and our two prominent grown-ups – Coyote’s “Keys” and Dee Wallace’s mother – do very well in their parts. They help make some rather two-dimensional figures seem full-blooded and real. But Spielberg didn’t use A Boy’s Life as the working title of ET for nothing, and the film concentrates heavily on Elliott and the others. Henry Thomas offers a truly miraculous performance as Elliott. Rarely will you see a youngster seem quite so much like a real kid on film. He never comes across as an adult in a little body, an issue that affects most child performers. Instead, Thomas delivers a sublimely natural and compelling performance that helps us get into the film and allows us to accept ET as a real being. The fine chemistry between Thomas and screen siblings MacNaughton and Barrymore assists the process as well. Again, Spielberg matches them in such a way that we really buy this little group as a family. None of them looks much alike, but that doesn’t matter. They mesh emotionally and interact together in a lively and realistic manner. Some may disparage ET due to it alleged sentimentality, but I strongly oppose such arguments. ET comes by its emotions naturally. Yes, it manipulates the audience to a certain degree – most films do – but it never does this a cynical or forced manner. All the swelling music and glowing imagery wouldn’t matter one iota if Spielberg hadn’t done his job right from the beginning. If he didn’t make us care about the bucket of bolts that came to be ET, no tears would fall and no cheers would arise. And that’s what makes ET one of the greatest films ever created. It’s a virtually perfect piece of cinema. It doesn’t pretend to be anything tremendously deep, though it does offer a fine snapshot of a fractured family; Spielberg delivers fine social insight that many will miss because of the packaging. Otherwise, Spielberg simply tried to give us a lovely fable. In doing so, he made an immaculate piece of work in which he never faltered. As a result, ET remains a movie for the ages, an achievement that may never be topped. Like I mentioned at the start of this review, my passion for ET has waned somewhat over the years. Whereas I once considered it my all-time favorite movie, now it simply resides somewhere in the top 10. However, I still see it as an amazing piece of work, and I regard it as the greatest family film ever created. As an outgrowth of sheer directorial will, ET stands as a flawless effort that continues to amaze. ET the Extra-Terrestrial appears in an aspect ratio of approximately 1.85:1 on this 4K UHD Disc. The movie came with an excellent presentation. Sharpness seemed solid. The original elements – usually related to optical/effects shots – occasionally betrayed a little softness, but those moments were unavoidable and minor. The majority of the movie offered tight delineation. No signs of jaggies or shimmering occurred, and the movie lacked edge haloes. I noticed no indications of intrusive digital noise reduction, and the image lacked any specks, marks or other print flaws, and it displayed a light layer of grain that gave it a good “film-like” appearance. ET featured a warm and natural palette that the disc replicate effectively. The colors showed strong tones that kept me impressed. Black levels also appeared deep and rich, while shadow detail was appropriately thick but didn’t seem too dense or dark. The transfer made the image look great and still resembled the ET I’ve known and loved for 35 years. As for the audio of ET, the DTS X soundtrack nicely complemented the visuals. Downconverted to DTS-HD 7.1, the soundscape demonstrated a nice sense of atmosphere and the different elements blended together well. During the louder sequences, the track came to life nicely and used all the channels well. ET’s ship zoomed cleanly from front to back, and the kids’ bicycles zipped around neatly. Because so much of the film stayed “small”, the track didn’t come with many chances to be “showy”, but it used the channels in a satisfying manner that allowed us to become involved in the material. The audio featured natural and warm speech that showed no problems related to intelligibility or edginess. Effects came across as clean and distinct. They played a relatively minor role in much of the film, but they also sounded accurate, and when required to take a more prominent part – mainly during the flick’s last act – they were nicely dynamic and vibrant. Music worked best of all, as John Williams’ score appeared rich and vivid, with clear highs and rich lows. The soundtrack never showed its age and delivered a fine auditory experience. 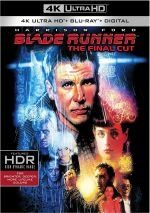 How did the 4K UHD version compare to the Blu-ray from 2012? Audio showed a little more breadth and kick, while visuals offered superior definition along with warmer colors and deeper blacks. The Blu-ray still looks great, but the 4K worked a bit better. This package contains a Blu-ray copy of the film, and that’s where all the package’s extras reside. B>A Look Back provides a 37-minute and 43-second documentary about the creation of ET. An abbreviation of the 90-minute program found on the 1996 deluxe laserdisc release, “Back” includes a few quick movie clips, but mostly it combines shots from the set with then-contemporary interviews with Steven Spielberg, producer Kathleen Kennedy, production illustrator Ed Verreaux, screenwriter/associate producer Melissa Mathison, actors Henry Thomas, Drew Barrymore, Dee Wallace, Robert MacNaughton, and Peter Coyote, voice designer Ben Burtt, filmmaker George Lucas, visual effects supervisor Dennis Muren, director of photography Allen Daviau, production designer James D. Bissell, space ship designer Ralph McQuarrie, and editor Carol Littleton. Despite the relative brevity of “A Look Back”, it provides a satisfying view of the production. The show covers many topics, as we hear about the film’s genesis as well as ET visual design issues, the development of his voice, some special effects notes, reactions to the finished film and many impressions from the day-to-day production. That latter area offers the program’s best aspects. We get a nice feel for how things went and see lots of great candid images from the set. Overall, those components help make “A Look Back” an entertaining and informative piece. So why didn’t Universal include the full documentary? I have no idea, as there’s no reason they couldn’t have tossed in the whole 1996 piece. The Jaws Blu-ray supplies its full-length originally-on-LD documentary, so why not do the same for ET? While the shortened edition still works, I definitely miss the full cut. A feature related to the 2002 reissue, The Reunion provides a 17-minute and 56-second group chat with the flick’s principals. It groups Spielberg, producer Kathleen Kennedy, and actors Henry Thomas, Drew Barrymore, Robert MacNaughton, Drew Wallace, and Peter Coyote. Though it mostly features their comments, it also tosses in some behind the scenes clips and a few movie segments. A fairly fluffy little piece, the shots from the set include the program’s best segments, as they don’t repeat much seen elsewhere. While it’s nice to see the principals reunite, they don’t provide much new information, as we mostly hear facts presented elsewhere. Probably the most compelling bit discusses the scene where the doctors work on ET. Though nothing special, it merits a look for ET fans. A participant otably absent from the other supplements, we focus on the film’s composer for The Music of ET: A Discussion with John Williams. In this 10-minute, four-second program, we get the usual combination of behind the scenes images and movie clips along with new interviews from Williams and Spielberg. Though fairly rudimentary, Williams offers a decent look at his approach to the film and gives us a reasonable amount of useful information. The highlight comes from an archival clip in which Williams plays the movie’s main theme to Spielberg for the first time. The 20th Anniversary Premiere runs 17 minutes, 49 seconds and focuses mostly on the live performance of the score during that screening. We hear from composer Williams, 20th anniversary edition editorial assistant Dana Glauberman, music editor Ken Wannberg, Spielberg, Drew Barrymore, Dee Wallace, Kathleen Kennedy, and Henry Thomas. We learn of the challenges presented by the live orchestra premiere and also get to see shots from that production. It’s a decent little piece that nicely illustrates this ambitious undertaking. Two Deleted Scenes appear. The first (2:40) shows what Elliott and ET did on their “sick day”, while the second (1:00) lets us see Mary as she hunts for Elliott on Halloween. Both of these appeared in the 2002 Special Edition cut of the film. The “sick day” sequence is enjoyable but inconsequential, while the Halloween scene never should’ve been in any version of the flick; it renders a later segment with a cop nonsensical. Speaking of the 2002 Special Edition cut, I don’t know why it fails to appear in this set. Granted, I’m happy that Spielberg has become the “anti-Lucas”: he now embraces original versions of his films and rejects only allowing fans to see altered cuts. This is a good thing, as I didn’t want the 2002 version to someday end up as the “default ET”. However, I see no harm in providing both cuts of the film. 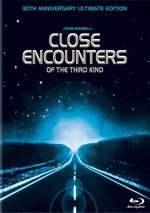 Spielberg put all three versions of Close Encounters on that Blu-ray, so why not offer the same choice for ET? It’s nice that the handful of extra scenes included in the 2002 edition show up here, but I’d have preferred them in the body of the film as an option. I’m also disappointed that other deleted scenes – like the famous one with Harrison Ford – remain MIA here. During the 12-minute, 31-second Steven Spielberg and ET, we hear comments from the director. He discusses the project’s roots and development, aspects of it that were personal to him, working with the young actors, effects, the film’s reception and thoughts about a sequel. Spielberg doesn’t dig into particularly new ground here, but he offers a decent, enjoyable overview. For the longest new extra, we go to The ET Journals. This two-part documentary runs 53 minutes, 38 seconds and features footage from the shoot. This means all the comments we hear come from the original sets; we find notes from Spielberg, Mathison, Thomas, Barrymore, Kennedy, Wallace, first AD Katy Emde, ET technical supervisor Steve Townsend and ET movement coordinator Caprice Rothe. While the remarks add some nice tidbits, the raw footage acts as the real attraction here – and this material becomes really valuable. I love “fly on the wall” elements of this sort, and “Journals” provides a terrific look at the shoot. We see a great deal of excellent material in this fine addition to the package. 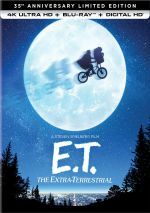 Originally titled “20th Anniversary Celebration” on the 2002 DVD, The Evolution and Creation of ET goes for 50 minutes, 16 seconds and includes comments from Spielberg, Mathison, Thomas, Barrymore, Wallace, Kennedy, actors Robert MacNaughton and Peter Coyote, ET creator Carlo Rambaldi, director of photography Allen Daviau, 2002 edition visual effects supervisor Bill George, 2002 animation supervisor Colin Brady, 2002 animator Shawn Kelly, and 2002 visual effects editor David Tanaka. ”Evolution” takes on two separate topics, really. The first 33 minutes or so offer a look at the production of the film and give us more good material from the set as well as additional insight into the flick. We see parts of Henry Thomas’ audition and learn other casting tidbits along with nice information about working with the ET puppet. In fact, Barrymore utters one of the best indictments of computer graphics I’ve heard, as she essentially tells us how a CG ET would have weakened the film since the kids bonded so strongly with the puppet. “Evolution” doesn’t reiterate too much heard in “A Look Back” and it features some nice material. After approximately 33 minutes, the focus shifts to the 2002 Special Edition. Spielberg tries to explain his rationale for the changes made to the movie. We also learn about the execution of the effects. Given my negative feelings toward the 2002 cut, this area didn’t do much for me, but it helped expand on the alterations. The presence of this section seems a little odd given the absence of the Special Edition cut on the Blu-ray, though. Another reason to miss the 1996 documentary: “Evolution” hints at segments much better explored in the old program. For example, we see more of Henry Thomas’ audition there, and we get to check out the entire Harrison Ford deleted scene as well as other excised clips. This disc’s presentation feels like a tease, and the absence of the deleted scenes seems cheesy. “Designs, Photographs and Marketing” splits into six smaller areas. ET Designs by Production Illustrator Ed Verreaux offers 42 screens of drawings used to influence the creature’s visual look. ET Designs by Carol Rambaldi provides 10 screens of similar material, though those take a more technical view toward the work needed to bring the puppet to life. In Spaceship Designs by Ralph McQuarrie, we get eight screens of those images, while Designs by Production Illustrator Ed Verreaux tosses in nine screens of more general art such as concept paintings and crew badges. Production Photographs features 139 pictures. Most of these come from the set, but we also see some publicity stills and a few that relate to the special effects. Marketing ET includes a mix of 62 publicity stills, ads and merchandise images. All told, these different sections offer a nice little look at the production’s different elements. Next comes the film’s Trailer. Note that while the 2002 DVD offered only the ad for the 20th Anniversary reissue, here we just get the original 1982 ad. Don’t expect great quality, though; it’s a windowboxed standard-def presentation. A 1980s vintage Special Olympics TV Spot that features ET finishes the platter. 35 years after its release, I can’t say I love ET The Extraterrestrial as much as I did in the 1980s. Nonetheless, I still cherish the film and regard it as one of the all-time greats; darn if that stinkin’ puppet still doesn’t make me cry. The 4K UHD brings us excellent picture and audio as well as a strong set of supplements. I still love ET and regard the 4K as the best version of the movie to date.